The vision for Save A Life Golf Classic was founded by a dedicated beneficiary and advocate of LifeShare Of The Carolinas, Gary Simmons. In early 2013, Gary was near death, but received a liver transplant when the donor family said yes to Life Share after the 4 sons of Peggy Long were asked about donating Peggy's organs. This new life has allowed Gary to begin "paying it forward" through the establishment of the Save A Life Group, a 501(c)(3) with the Save A Life Golf Classic being the first awareness event. Gary lives in Davidson, is a Vietnam Veteran, avid golfer, fisherman, church volunteer and mentor to 6th graders, and is married to Pastor Lib McGregor Simmons and has one son Stewart McGregor (Mac) Simmons. 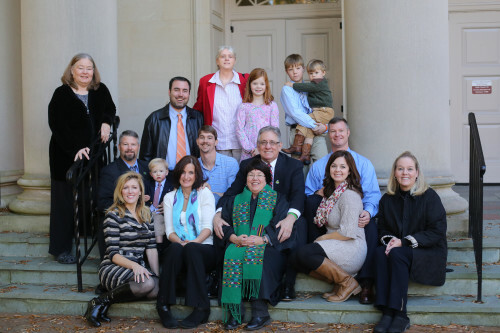 Learn more about Gary's donor and their family in the following article written by John Deem of the Lake Norman Citizen (click here). 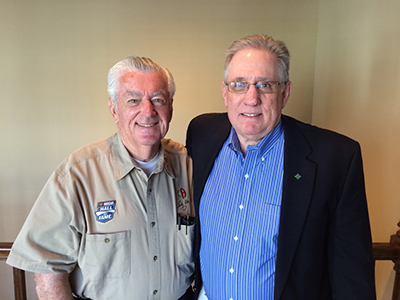 Save A Life Group is honored to have former NASCAR Winston Cup driver, Bobby Allison (pictured above, left, with Gary Simmons), serve as Honorary Chairman of the first annual Save A Life Golf Classic. Bobby was named one of NASCAR's 50 greatest drivers and was inducted into the NASCAR Hall of Fame in 2011. His son Davey's untimely and tragic passing in 1993 led to an inspiring story of compassion and hope, as his death resulted in organ donations that saved the lives of four recipients. Davey's wife Liz made the heroic decision to donate his organs. Despite the tragedy surrounding the loss of Davey, who was also a successful NASCAR driver in the early 1990′s, his passing forever changed the lives of his organ recipients' loved ones, exemplifying the amazing gift that organ donation can be.